This basic vertical water smoker is built on a kind of modular design that allows you to mix and match parts to give you a wide range of function. While more expensive than other similar units the good construction and varied functions make this a great cooker. As a smoker, you get to choose between gas and charcoal fuel as well as add wood for good smoke production. The excellent temperature control makes it a great smoker for the person who doesn't want a huge amount of barbecue but wants to be able to cook it up easily and frequently. Basically, this is a smoker/grill unit that can run on either propane or charcoal. You can use the propane burner to light the charcoal making lighting very easy. While a relatively small unit, this cooker performs both functions very well. The high heat output makes it a great grill while the good temperature control and smoke making abilities make it a very good smoker. 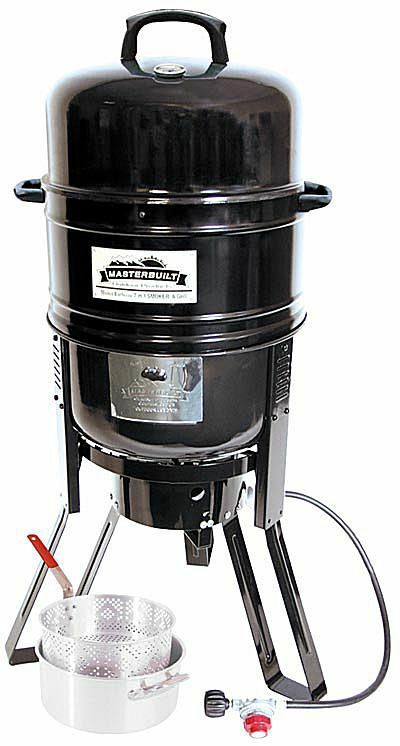 The "7-in-1" name refers to the use of this unit as a gas smoker, charcoal smoker, gas grill, charcoal grill, camp stove, deep fryer, and a seafood boiler. Basically, this is a propane burner on a stand with a multi-function cooking chamber on top. The function you get out of the unit is really up to you and what you want to use it for. Because of the small size and easy portability, this is a great unit to take on the road or pack away if need be. This is a very good unit for tailgating and camping. At around $200 this unit gives you a lot of cooking abilities for the price. The good construction means you should be able to keep it running for many years.